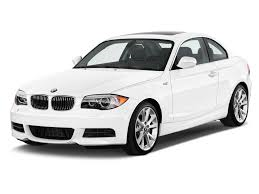 The 2012 BMW 1 Series. Yes, it’s beautiful but, I’m not interested. While discussing finances with my guy last night the topic inevitably came around to the delight we feel at not having a car payment. He owns an older model Chevy Suburban, and I drive an older model Jeep Wrangler, neither of which is what you might call fuel efficient. Shelling out $300 a month on gasoline hurts, yes, but not as much as it does when one’s also shelling out a few hundred bucks to pay down a car loan. Having made monthly car payments in the past, we’d both prefer to own a less expensive vehicle than tap credit just to drive a newer one. But then my guy commented that he doesn’t really care what he drives as long as he, not the bank, owns it. And that brought me up short. Because I do care. A lot. And it’s not because I need a status symbol, or because I’m a brand snob. It’s simply because I love the act of driving, but only vehicles that “fit” me. A few years ago I transported a BMW from one Butler lot to another. It was a beautiful car and, as one would expect from a performance vehicle, drove well. But it just wasn’t… me. Something about the cab design was uncomfortable, cramped. And given that the windows in my Jeep have to be rolled down by hand, the Beemer might simply have been too luxurious. In the same way we sometimes describe perfectly nice people we choose not to befriend, that sedan and I just didn’t “click”. For my guy, however, a vehicle is about getting from point A to point B, period. While I’m grateful I don’t feel a burning desire to go into debt for a new set of wheels, I’m also jealous of his logical point of view. Driving, for him, is a necessity, a fact; There’s no emotion involved. Which, unfortunately for me, takes all the fun out of it. I completely identify! I fear too many people today, especially the soccer moms and Gen Y crowd, view vehicles as toasters on wheels — a necessary evil to get from A to B — to which they have no emotional connection whatsoever. I’ve driven, and even owned, cars that didn’t “click.” For a “car guy,” it can be a downright depressing experience. I now own my dream vehicle, a Jeep JK, and I can’t imagine driving anything different! Thanks, Smokey! I think a lot of Jeep owners/drivers feel that way. I appreciate your feedback!